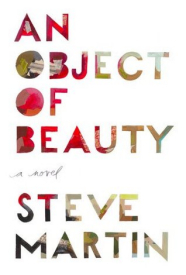 I can’t think of a lovelier way to relax during the blustery days of winter than sitting back with a copy of Steve Martin’s latest novel An Object of Beauty. One of the most multi-faceted figures in popular culture, Martin has demonstrated considerable skill as a comedian, actor, musician, playwright and novelist. His first novel Shopgirl (for which he also wrote the screenplay) was a dreamlike examination of an unlikely romance between a vulnerable young woman and an older man with more defense mechanisms than the Pentagon. With his latest novel An Object of Beauty, Martin gives us a much more formidable heroine in Lacey Yeager, whose fast rising career in New York’s art world is told with wit and elegance. Like a 21st century Henry James novel, the story is told through the eyes of a young art critic who seems mesmerized, attracted and intimidated by his longtime friend Lacey. Since Lacey begins her career in the art auctioning house of Sotheby’s, while Daniel Franks becomes a critic for Artnews, it is to be expected that the reader will be given an inside look at the world of buying and selling art -- with an occasional example of fraud thrown in for good measure. Set in the time period 1993 to 2009, the story of Lacey Yeager covers the boom, then bust, of both the art and financial sectors (which are inextricably linked). Lacey however seems to usually be one step ahead of the game. Indeed, her wit, fearlessness and beauty sometimes brings to mind Thackery’s Becky Sharp, yet another resilient heroine. As an unexpected bonus, color plates of 22 works of art are interspersed to better illustrate what one of the characters has recently mentioned. Since these works are not by Old Masters, many readers will be grateful to see exactly what the characters are referring to when they mention artists such as Dorothea Tanning and Giorgio Morandi. But the heart of the story belongs to the beautiful and intelligent Lacey Yeager, who doesn’t seem to have a romantic bone in her body, yet is all the more fascinating because of it. She’s the type of person you would love to be seated next to during a long dinner party just to hear her caustic, yet always amusing, comments. “I’m thinking of getting a dog,” she said. “What kind?” I asked. “One that’s near death.” “Why?” “Less of a commitment,” she answered. Lacey is a woman seduced not by money but by success, especially her own. And her adventures in the only art center that matters - New York City - make for a riveting, intelligent and endlessly witty read. My To Be Read stacks are perilously high, leaving many books buried or forgotten – sometimes for years. Luckily I was moving furniture last month, and found yet another pile of books I hadn’t gotten around to reading. 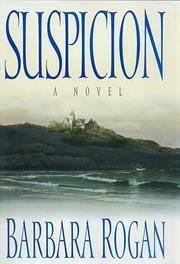 A hardcover novel caught my attention with a title and cover promising something mysterious: Suspicion by Barbara Rogan. I didn’t even bother to glance at the inside of the book jacket. After all, I wouldn’t have brought it home in the first place if the story hadn’t piqued my interest. Well, I didn’t have to read very far before I realized I had purchased a first-rate suspense novel. Emma is particularly drawn to the octagonal tower room overlooking the cliffs and crashing waves. It certainly seems an ideal spot in which to write her bestselling novels, all of which just happen to be ghost stories. She convinces herself that the move will be good for both her husband and her 10-year old son Zack. So despite its steep price and isolated location, the Roth family buy the home. In order to help pay for the hefty mortgage, the Roths take in a boarder who rents the carriage house on the property. The new tenant is Caroline, a psychologist, who is fleeing a bad marriage and takes a dim view of all men, including Emma’s handsome husband. As Emma and her family settle into their new routine in the village, she discovers that it isn’t the absence of city life that troubles her, but a growing sense of uneasiness. The trouble begins in the third floor tower library. What she hoped would be her writing sanctuary now becomes an almost sinister place. Alarming messages appear on her computer and in the book manuscript she is working on. Then there is the feeling of being watched and the refusal of her dog to follow her up into the tower. Could the house be haunted? If so, she is reluctant to say anything since she fears people will only claim she lying about it as a gimmick to sell her next ghost story. However just when the reader thinks this is merely an atmospheric ghost tale, events transpire that indicate there is a person who clearly wishes to harm Emma. But who can it be? The beauty of Rogan’s novel is that it is so aptly titled. Indeed suspicion permeates nearly every page. The reader - along with Emma - will come to suspect virtually every character at some point in the story of being the dangerous culprit. This is a good old-fashioned read in the best sense. Filled with a sympathetic heroine (who has a secret of her own) and a colorful cast of characters that take turns seeming like allies one moment, and alarming suspects the next, Suspicion will keep you turning the pages long after you should have gone to sleep. But the lack of sleep is well worth it. Rogan has written a satisfying, and endlessly intriguing tale with a nail-biting climax. This is the first novel by Barbara Rogan that I have read, but it certainly won’t be the last. And after reading Suspicion, I suspect that – along with me - you will go in search of her other novels. Along with chocolate candy and a big red card, there may be no better Valentine gift for your child than Love, Ruby Valentine. While both boys and girls will enjoy Ruby’s story, the pink book jacket is sure to catch the eye of little girls first. Ruby Valentine is a young girl who lives in a charming house in Heartland with her feathered friend Lovebird. Not surprisingly her favorite holiday is Valentine’s Day. She waits all year to create her Valentine gifts and hand them out to everyone she cares about. 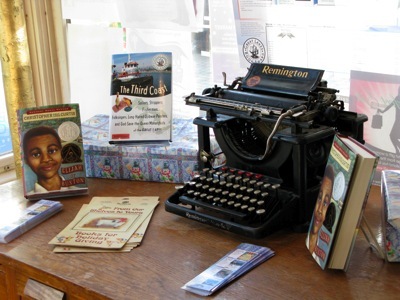 This year is no different and Ruby – along with Lovebird - are hard at work getting ready for the big day. When the book begins, it is five days until Valentine’s Day. As the days count down, Ruby and Lovebird are seen drawing, curling ribbon, sprinkling glitter, and baking heart-shaped cookies and cakes. But exhausted from so much effort, Ruby sleeps all through Valentine’s Day, only waking up on February 15th. Ruby is naturally upset that she has missed her chance to tell everyone how much she loves them. Still she and Lovebird decide to load up her wagon and distribute her gifts to the town even though it is no longer Valentine’s Day. But when she apologizes for being late, she is surprised that no one seems upset. In fact, they are very happy to receive her Valentine wishes, no matter what day it actually is. Cravath’s amusing illustrations perfectly complement Friedman’s clever rhyming text. 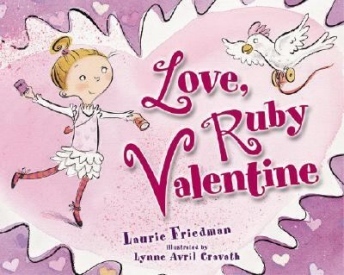 And long after Valentine’s Day has come and gone, your child is sure to ask to have Love, Ruby Valentine read to them again and again. 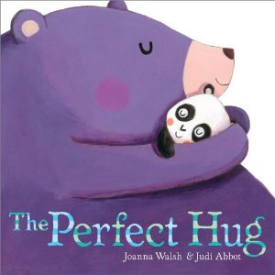 Although The Perfect Hug dovetails nicely with a holiday that celebrates love such as Valentine’s Day, it is a delightful picture book that can be enjoyed year round, especially when it’s time for a goodnight kiss and hug. Told in rhyming verse, The Perfect Hug centers on a panda cub trying to discover where he can receive the perfect hug. As he searches for the answer, the bear cub also wonders what it would feel like to be hugged by other animals such as snails or dinosaurs. For example, the hug from boa constrictor is sure to be too tight, and a grizzly bear’s embrace is just too big and scary. “And what about a jellyfish with all those stingers? Even hugs from creatures living somewhere out in the Milky Way are considered until he at last finds the easy peasy answer to what is a perfect hug. The story is enhanced by Abbot’s whimsical illustrations, and the rhyming text is fun to read aloud. Small children especially are sure to want to give you a perfect hug once you’ve read them this lovely book. Btw, this book also makes a wonderful companion piece with Walsh and Abbot’s 2011 book The Biggest Kiss.